Some outsider environments get a lot of publicity on the internet. Try "facteur Cheval" on Google and you will get a lot of hits. Of course, I also wrote about Cheval's unbelievable creation, but my special attention goes to the lesser known sites. Apart from some articles in the local press, Joseph Duffour's creation has been presented only in the french magazine Zon`art, nr 8 (published early 2003). The article is by Jean-Michel Chesné, who gave me his friendly permission to draw on his material. And then in march 2010, I came into contact with a member of Duffour's family, who provided me with some more information ¹.
Joseph Duffour was born in 1922 in the community of Marin, near Thourou-les-Bains, in the Haute-Savoie department of France. He had a job at the french railway organisation SNCF, from which he retired in 1977. The family does'nt not know what inspired him when in 1963 Duffour began transforming the garden around his house in the community of Saint Gervais into an art environment. It became a project that would keep him busy for the rest of his life, working many hours, sometimes day and night in what he himself called his "rocailles" ("rockies"). 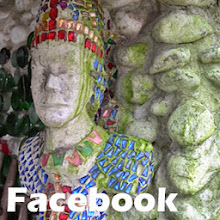 This resulted in a variety of constructions in concrete, decorated with shells, glass mosaic, small statues and all kind of recuperated materials. Like Duffour's relative wrote me: "He uses any object that can inspire him, wherefrom he makes a concrete cast (doll, mask, sometimes even boxes of Nesquick) and he integrates these casts in concrete blocks, decorated with tiles, stones and shells, he has collected on the [...] coast". The rising structures include shrines with small sculptures of the virgin Mary and saints, among whom St Joseph. The site has a small area provided with some benches, where one can sit quietly and can overview the beautiful landscape, watch the sunset and enjoy the majestic scenery of the french Alps. Duffour's place of living, Saint-Gervais, is a well-known skiing resort in the Mont Blanc-area in the Haute Savoie department. Duffour apparently was not inspired by -or maybe even did not know about- other outsiders who made art environments: "Facteur Cheval? I do not know him, have never seen him in my life..." , he told Jean-Michel Chesné in 2003. In 2005, however, he paid a visit to the Palais Ideal and remarked that he considered his own creation to be completely different from the one by Cheval, what obviously is a correct observation. Joseph Duffour is a modest man. He has not made his creation to arouse interest from the general public, nor has he tried to get publicity, although the site got publicity in local/reginal journals, like it also was shown on regional television. The site is not open to the public and I wil refrain from giving an adress. Currently (2016) 94 years ould, Joseph Duffour is no longer able to take care of the art environment he created. * The website art-insolite has some pictures (dated december 2002), the text draws on Chesné's article. Wonder how it would look like in winter after after a snow fall. Shells and snow together in a mountainous landscape, a strange yet facinating mixture. Shells in a mountain were the origin of a sour argue between Voltaire and Buffon, one afirming that were the prove of the constant regenerations of the Earth, rubbish said Voltaire, pilgrims from the coast dropped them, later the rain "imbedded" the shells into the mud. Cold minded Voltaire and passionate Buffon. I did notknow about the argument between these two. My sympathy is with Buffon. I did not publish this, but as far as I understand mr Duffour collected the shells when he was on holiday in a seaside resort (Agde, to be specific). Henk, I'd never heard of this place, so hat is off to you again for your detective skills. That is a beautiful area of France, next time I'm down that way will have to take a look. Interesting story from Alberto there about Voltaire and Buffon. Is it something about Railways that inspires people? I am thinking of Nek Chand in India. I note that the site also says that Nek Chand apparently began his work in 1963. A lovely correspondence.